Learn the process of creating and manipulating dough to create Wood-Fired Neapolitan Pizza and Fried Pizzas from scratch. Learn from the Master Chef, Antonio Starita in this hands-on, 3-day experience! Antonio Starita got his hands into the dough at just 12 years old. Now a third‐generation pizza‐maker and owner of one of Naples’ oldest and most revered pizzerias, Starita is carrying his family’s Neapolitan tradition into the next generation. Indeed, not only has Pizzeria Starita a Materdei flourished under his ownership, it attracts crowds from well beyond city limits. With a successful business at home, Starita made his way to the United States, partnering with Roberto Caporuscio to open Don Antonio in New York City last February. As authentic as stateside pizza gets, Starita’s Neapolitan pies quickly won local (and national) acclaim, voted “Best Pizza” by New York Magazine in its annual “Best of New York” issue, and featured in The New York Times, The Wall Street Journal, and Food & Wine. Meanwhile, Starita has earned some well-deserved fame. His restaurant was immortalized in the Sophia Loren film “L’Oro di Napoli,” and Starita himself was selected as lead delegate called on by the Vatican to present pizza to Pope John Paul II. Starita is as much an advocate as an icon of the Neapolitan pizza industry, and his outreach is global. 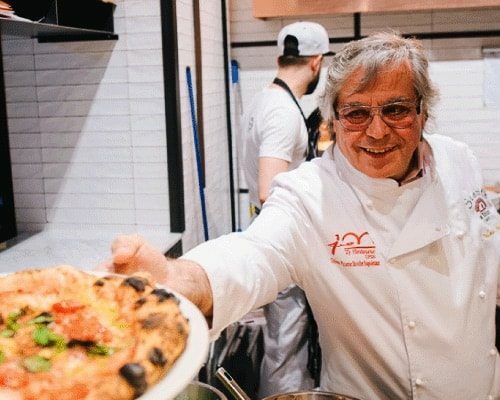 Between serving as International Vice President of the Association of Neapolitan Pizzaiuoli and traveling the globe to share the art and craft of Neapolitan pizza, Starita is ensuring this exquisite culinary legacy of Naples—not to mention his own family—will live on for years to come.